I had the most ridiculous commute to work today. Long story. Developed economy + weird immigration policies + shortage of “semi-skilled” workers = broadband takes 4 months to set up. Yes, four months. Broadband. Not fibre optic but broadband, needs phone line. Four months because if you reschedule, their silly system doesn’t seem to register it even though you get a confirmation email. So yes, I had to stay back home today waiting for an engineer to come fix my phone line so that I could finally have broadband after months of waiting (do I finally have it, no I don’t because they still haven’t sent me my router, though I am being billed from today on). End of rant 1. But this story isn’t about that. It’s about the Duchess. My beautiful bike and the adventures she forces me to have. Because I was to go to the office past 10 am today (refer rant 1 above), I thought I could bike to the train station, carry the Duchess on the overground and then cycle from Wapping station. So far so good, we’re on the train without incident until I think surely I can take her onto the underground too, why get off at Wapping and spend time cycling? At Shadwell station, as a gentleman got up to alight, his bag fell open and a number of his personal items fell to the floor. He hastily assembled his belongings but by the time he sprinted to the door, he was too late and missed his stop. Just as the announcement came on proclaiming the next stop to be Wapping, he looked at me, I said , “oh dear” and he said “We’re going to Wapping”. I should have taken that as an omen. So I switched at Canada Water from the Overground to the ungerground and just about missed a train. While I waited for the next, an announcement came up – “Will the passenger with the bike please be advised that you cannot take your bike onto the jubilee line as it is not a folding bike?”. Embarrassment. Acute, oh so acute. What the hell! I’ve seen bikes on the jubilee loads of times! The voice continued to instruct me as I felt every eye bore into me – “If you make your way to the ticket counter, you can speak to a member of staff about an alternate routes”. Oh gosh. The voice went on to instruct me about the direction I needed to take to find the elevator when I appeared to flounder. It was getting a bit stale now. Anyway, it turned out that the best way was to indeed go back to Wapping (I’m going back to Wapping!) and cycle from there to work. I waited about 4 minutes for a train. At Wapping (where there is a gap between the train and the platform requiring you to lift your bike), I saw steps and no elevator. I wasn’t going to carry my heavy bike on that! So I waited for the next train to go to Shadwell (again 4 minutes). I was pretty sure I’d used an elevator there in the past. I was beginning to feel pretty desperate to get to work by this stage. This was taking forever! At Shadwell, steps again! What! Resigned to my fate, I realized I had to do it. Someone kindly offered to help carry it and we got her up together. And then everything changed. Just outside Shadwell was the Cycle Superhighway 3 (CS3) marked in bright blue. We just whizzed from that point on, sailing in the air. The wind in our faces, poetry in every move, every turn. I was late to work, it was afternoon, but it was sheer glory – I was on my bike. Even a basically directionless person like me can follow a marked path. Thanks Boris. Sadly the path did come to an end and then I was on my own and a bit lost but I did eventually make it. The first time I biked to work (well part of the way anyway) since I moved to this apartment. In the evening, I didn’t have the heart to leave behind the Duchess in the cold parking lot. So I printed out a route map, putting aside fears of exploring a new route in the dark for the first time. I didn’t get a chance to look at it too often and I did get waylaid a few times but in the end I made it back home. It almost felt like a conquest. The cat was on my doorstep and let me pat her. She stared in awe at the Duchess and made way for her. I put out a bowl of milk for her and ordered pizza for myself. This weekend was a lot about the Duchess. I cycled to the local Halford’s to get her gears checked and see if there was anything else she needed. Riding hasn’t been smooth of late and I wanted an expert opinion. We spent more than an hour there but when we were done I had smoother brakes, back wheel realigned, and more traction, for lack of a better word. They called her “Dutchie” at the shop, how cute – I think that name’s going to stay. One-way roads while cycling back combined with my lack of direction-sense meant what could have been a 3 minute journey was turned into 20 minutes as I was hopelessly lost in back roads. Today was a foggy day and I rode down to Shoreditch for lunch. This was a proper bike ride after a long, long time. But unlike the easy rides by the river I used to enjoy previously, this was largely on Kingsland road with fast moving vehicular traffic for most of the way. But it was good for confidence building and I am definitely going to go out biking a lot more now. 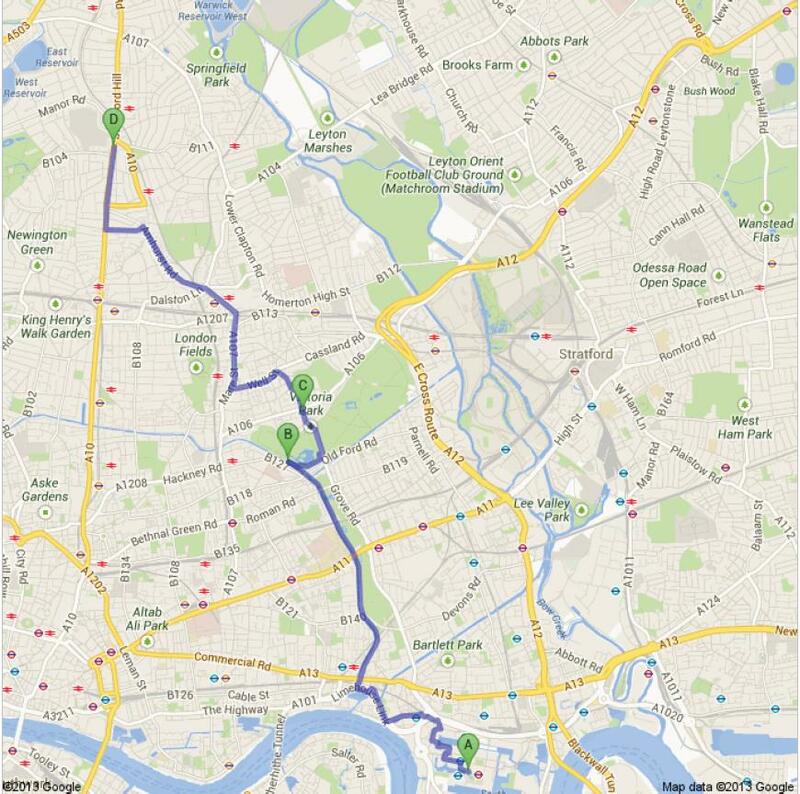 Going towards Shoreditch, I initially took the little lanes, off the main road, before joining it at Dalston. Even then it was a lot of fun, going down the sloping road I didn’t even need to pedal much. My favourite bit about this stretch of the road so far is the Geffrye Museum, near Hoxton station. I love its lovely building and garden; its almost like an oasis. Perhaps I’ll visit it sometime soon. My aim for riding down to Shoreditch was also to try out some good Indian cooking at Dishoom, opened here in October last year. The restaurant pays homage to Bombay’s dying Irani cafes, and is complete with black, slow-whirring ceiling fans, and admonitions on not sleeping in the toilet or flirting with the cashier. I quite liked the place. The food I had was good too, though I really think the biryani could have been spicier but they do have to cater to local tastes I suppose. Of course the decor makes improvements on the original cafes – for instance, the tables are smarter and the lighting is much better than in the average Irani. However, I did think the floor would have been better with the traditional large black and white chequered pattern. I lingered about after lunch, taking time to sip my lassi, read the papers and had pista kulfi for dessert. Again, not the most authentic but hey, it’s kulfi 20 mins from home! Post-lunch, I was glad to find the Duchess still in the place where I’d left her. I realised that despite all our outings together, this is the first time I’d actually made a stop anywhere, work not included. The ride on the way back was slightly uphill and I felt the full effects of the full meal. I found myself even hoping for the lights to turn red to get a breather but I pretty much had an uninterrupted ride back to Stokey. No longer fit! This evening, I was surfing TV to find something to go with the pav bhaji I’d made and I came upon “Five go to rehab”. The Famous Five, thirty years on, as adults who’ve done rather badly for themselves in life. It was quite amusing. And following that episode was “Five go mad in Dorset”, shot in 1982 when the five were young. This was supposed to be satirical. I’d never realised as a child that Enid Blyton’s books were so racist and sexist! But publishers have been altering them since years apparently to better cater to modern sentiment. Oh dear!